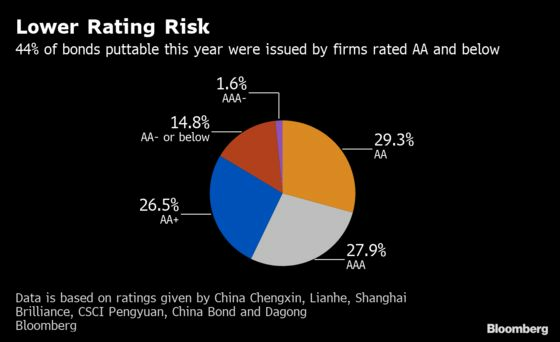 (Bloomberg) -- Pressure is building for China’s bondholders to forgo their right to be repaid early as more companies show signs of strain amid a record amount of puttable debt this year. Pang Da Automobile Trade Co., a Chinese car dealer, sought to delay a put date on a bond for the second time in February. Jewelry maker Harbin Churin Group Jointstock Co. couldn’t make a put option payment that came due late February, while Guangdong Homa Appliances Co. extended an early payment date by a month. Jewelry wholesaler Jinzhou Cihang Group Co. said on Tuesday it also won bondholder approval to delay early redemption on a note. Such cases are adding to concerns that the wave of early note redemptions will spur more defaults in China and keep credit stress elevated. 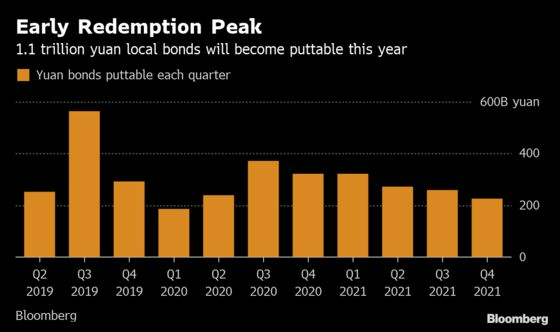 A record 1.1 trillion yuan ($164 billion) of bonds have put options exercisable from now until the end of 2019, Bloomberg-compiled data show. Puttable debt allows bondholders to demand repayment even though the notes don’t mature until much later. One investor who asked not to be identified said he chose to forgo his right to be repaid early on a bond to avoid the risk of forcing the issuer into an immediate default. With the company pledging to repay within several months, it made sense to wait longer, he said. Yet choosing to hold on to the notes of longer-than-expected duration still risks a potential default anyway at the maturity date. Take Pang Da Automobile Trade for example. The company defaulted on a separate note days after it sought to delay a put date on a 1 billion yuan bond, according to a company statement to bondholders obtained by Bloomberg. Chung said bondholders usually agree to accept delays in payments provided there are clear plans for compensation or fundraising plans. However in recent cases, it is unclear if they have gotten that kind of reassurances. In March, state-owned Tianjin Real Estate Group Co. asked creditors not to exercise a put option on its bonds, according to a REDD report. The troubled developer planned to pay only about 24 percent of the principal to unidentified bondholders after missing the original due date for early redemption, according to people familiar with the matter. As details of the negotiation between Tianjin Real Estate and its bondholders were undisclosed, it’s hard for investors to assess the potential impact on the issuer’s other debt. The company has $100 million dollar notes outstanding on top of at least 19.2 billion yuan of local bonds.